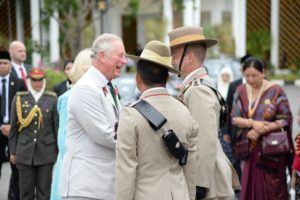 T he Prince of Wales and the Duchess of Cornwall were festooned with garlands when they visited 2 Royal Gurkha Rifles who are based in Brunei on 2nd November 2017. 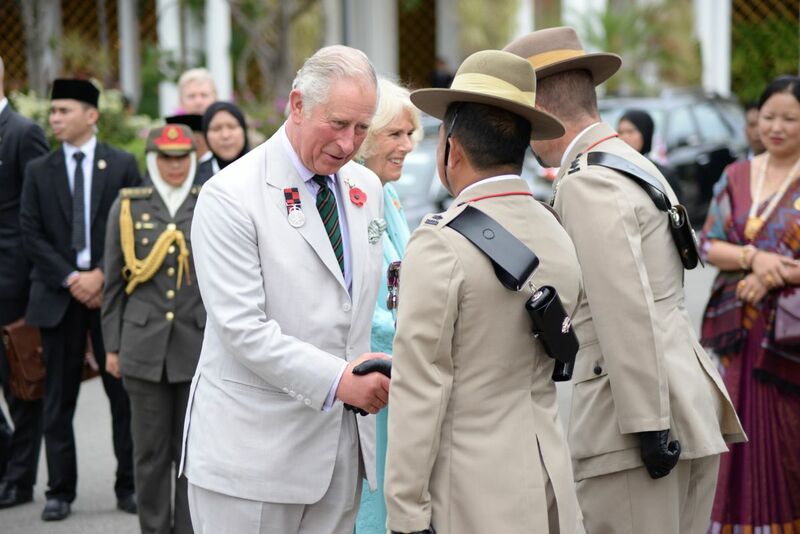 HRH The Prince of Wales has been the Colonel-in-Chief of the Royal Gurkha Rifles for 40 years and he took the chance to chat to members of the Regiment at a reception, his questions had a parental tone. “Are you able to find the things you need?” he asked one group, then made them laugh when he said “can you get enough goat?”. The Royal Gurkha Rifles have a jungle role battalion permanently based in Brunei. The soldiers are solely drawn from Nepal. Lieutenant-Colonel Jamie Murray, the commanding officer of the 2nd Battalion Royal Gurkha Rifles, hosted the royal couple during the reception at a Brunei royal family residence called Edinburgh Palace. His HRH and the Duchess arrived in Brunei they were met at the airport by Brunei’s Crown Prince Al-Muhtadee Billah and his wife, Princess Sarah. They are there as part of a tour of Singapore, Malaysia, Brunei and India. This year marks His Majesty The Sultan Of Brunei’s 50 years on the throne in Brunei. 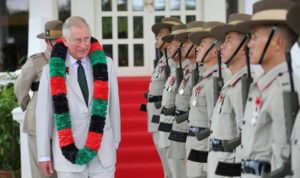 The Sultan has always paid special interest with the resident Royal Gurkha Rifles battalion and takes time to visit them in the barracks in Brunei or regular occasions.